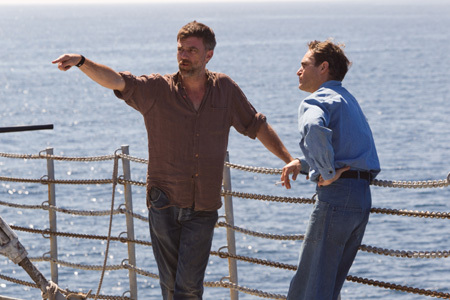 Though THE MASTER is wholly fictional, Paul Thomas Anderson set out to present the world of The Cause with a visceral and transporting realism. To capture both authentic period details and the imagined environs of The Cause on sea and land, he worked with a devoted crew, many of whom have forged a kind of family of their own, reuniting again and again on his productions. One major, if entirely intuitive, decision immediately set the film off on a very individual course: Anderson’s choice to shoot THE MASTER with the now exceedingly rare 65mm film stock. From the start, he knew he wanted a distinctive period look – and after immersing himself in the vibrant tones and textures of such 50s cinematic classics as VERTIGO and NORTH BY NORTHWEST, Anderson hoped to mirror that supersaturated lushness, merging it with his own signature style of stark lyricism. With imagery spanning from the roaring sea to the shadows and light at play within the characters, 65mm seemed a perfect match for the broad contours of the story. Anderson says the choice started as an exploration, but became a commitment once he saw the fit with the storytelling of THE MASTER. “The idea was something initially suggested by Dan Sasaki, Panavision's lens technician, after I'd inquired about Vista Vision Cameras from the 8 50s, just to play around with and figure out how some of these 50s films created their look,” he explains. The filmmakers are gratified that some audiences will get a chance to see the film in 70mm projection. “In an ideal world, audiences can enjoy the film in 70mm. 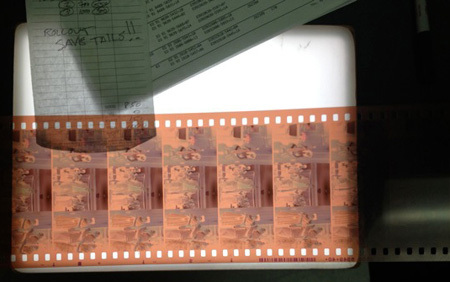 There are still theaters playing 70mm films, thank goodness. Long may they wave,” says Anderson. 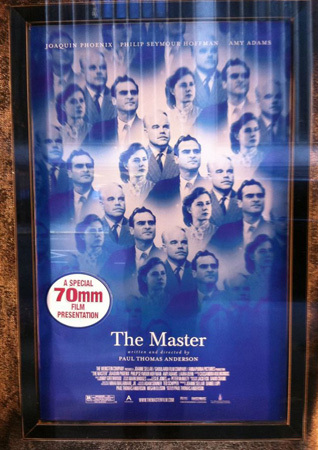 As principal photography of THE MASTER came to a close, Anderson worked with editors Leslie Jones and Peter McNulty to weave the imagery with his distinctive rhythms and pacing. McNulty did a first cut and then Jones, who previously received an ACE nomination for her work on Anderson’s PUNCH-DRUNK LOVE, came on board. She was taken right away with the footage. “Peter did a beautiful first cut of the film and I was impressed with the complexity in both Freddie and Master's characters as well as the depth in their relationship. I was surprised at how the love story between these two men so gracefully became the focus of the film,” she comments.